Following the recent release of Azymuth’s new album Fênix, we’re proud to announce a 12” reissue of two of the Brazilian mavericks’ heaviest dance cuts, remastered from the original Outubro tapes. Alex Malheiros’ earth-shaking slap bass in the first few seconds of ‘Dear Limmertz’ makes up an iconic moment in jazz-funk history. 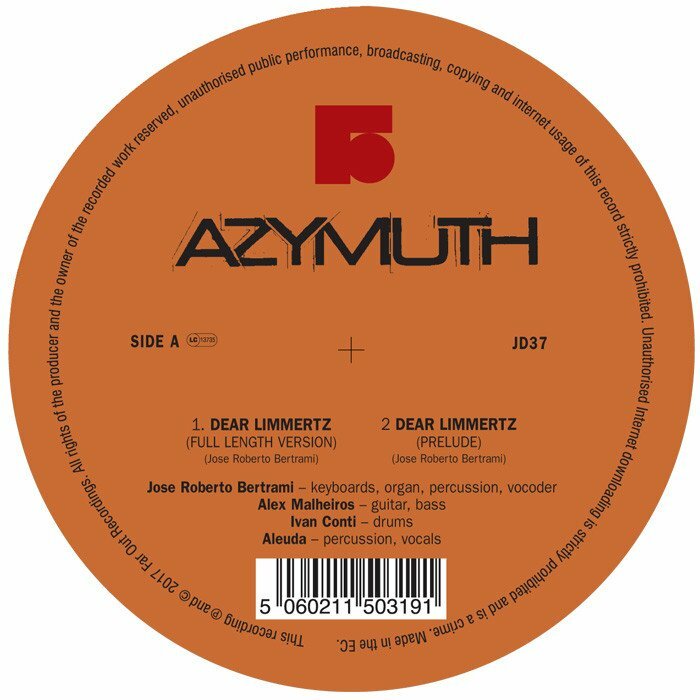 Next to their groundbreaking disco hit ‘Jazz Carnival’, it’s one of the heftiest of Azymuth’s dense and still growing catalogue of floor fillers, along with being one of the trio’s most recognized tunes. The flip is home to the equally club ready ‘Maracana’, another super-heavy jazz-funk belter encompassing Ivan ‘Mamao’ Conti’s signature swing, backing Jose Roberto Bertrami’s effortlessly slick keyboard harmonies. Both tracks were classics on the London Rare-Groove scene in the 80’s and remain as relevant today as ever. Now re-mastered from the original tapes and pressed onto heavyweight 12” vinyl, the sole purpose of this release is to make these career defining tracks sound bigger and bolder than ever before, and we honestly can’t believe how PHAT these new remasters sound on vinyl.